grecian earth and turf, originally uploaded by aarn! +30th June, 2008+. a fage strained greek yogurt, garlic, cucumber, and mint sauce was applied to a spinach salad with green onions and hard-boiled egg. 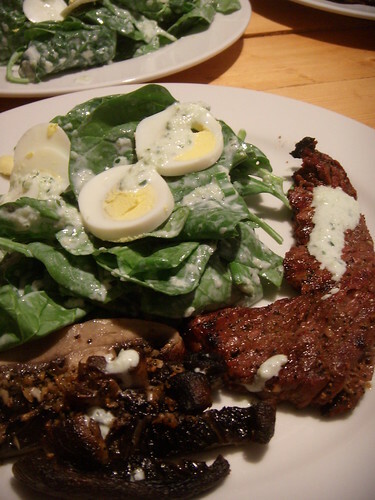 grilled portobello mushrooms and a slice of grilled sirloin accompanied the salad. the idea was that the sauce would just be on everything, and that's how it was.